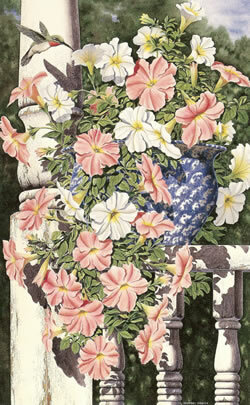 In celebration of summertime Dempsey Essick has portrayed a cascade of petunias overflowing their container and spilling across an old porch railing. It is the time of year when days are long, nights are warm and there is an abundance of nectar for the ruby-throated hummingbird. The pot of petunias rested on the banister here. 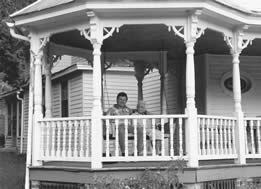 On a visit with Irena McCormick, in Albermarle County, Virginia, Dempsey placed one of Jerry Beaumont's hand turned pots filled with petunias on the porch railing of Irena's home. Irena and her beautiful home with it's remarkable architecture and a gazebo built right onto the front portch was the subject for one of Dempsey's prior paintings, Springtime at Irena's. The arrangement made a beautiful study in contrasts between the sheen of the pot, the texture and color of the flowers, and the weathered paint of Irena's banister. The scene is so realistic some viewers have been known to reach out and try to lift a loose chip of paint with their fingernail. Jerry (Gerard) Beaumont, of Beaumont Pottery in Seagrove, gave me the beautiful spongeware pot used in Summer Fragrance. After trying other locations I wound up at Irena McCormick's hundred-year-old home in Albermarle County, Virginia. It's one of my favorite locations, and Miss Irena, who is now 106 years old, is one of my favorite people. The contrast between the new pot and the aged paint on the banisters was just what I was looking for.